One of the earliest mini figure memories I have is getting the guy pictured above, named BRAK (as written on his stomach), in a kid's meal at one of those cafes that used to be in K Marts in the late '80s. 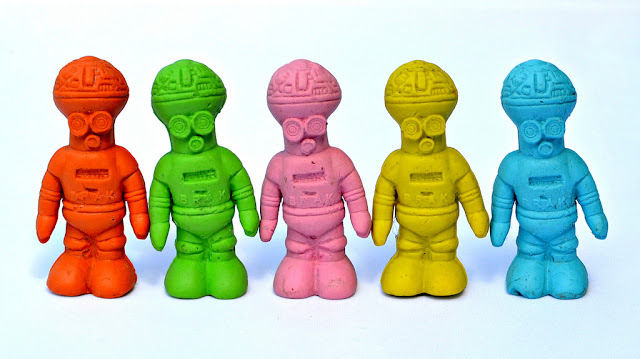 I'm aware that he and the other figures in his set of erasers--Space Raiders, made by by Diener--are known for being offered in McDonald's Happy Meals, but apparently K Mart joined the Space Raiders party somewhere down the line. I've always had a soft spot for BRAK. Maybe it's nostalgia, since he was one of my first figures. Or maybe it's just because he's a freakin' cool-looking robot-alien with a gigantic cranium! Probably both. My original figure was green, and didn't survive the years (for some reason when I was a little kid I often had a hard time distinguishing between toys and candy...), but years later I was able to replace him--not just in green, but in a variety of colors. Behold the BRAK rainbow! For pics and info on all of the Space Raiders, check out this blog post. For more Diener goodness, check out my Diener photo set on Flickr and my previous posts on Diener Space Creatures and Diener Mythological Creatures. These guy would be perfect for Thegodbeast to make custom colors of. I had no idea...thanks for that info! Thanks Devlin, I always assumed BRAK was a take on the Metaluna Mutant from This Island Earth (1955)!